Jazzy Cat Stratocaster Pickup Set - "We use these in our Black One Strat" Same Outputs, Same Inductance, Same Stagger. Scooped Mid Range Tone. The closest that one can get to Euphoria in tone. We have spent countless hours researching, to obtain all the information necessary to build a set of pickups that gets this Tone. We went through several dozen test sets in the development, fine tuning each to get as close as possible. We also had to order special magnets to stock for this set. The neck has a very unique stagger while the middle & bridge have the same stagger, but it is as well is different from traditional vintage stagger. 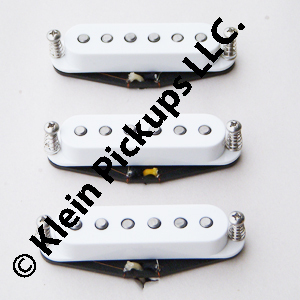 These pickups are lower in output (not low output) providing that scooped mid range tone, very clean, while still full in the low end, provides that extreme crystal clean quack which is a signature characteristic to this set. The set has Hand Beveled Magnets, wax potted, & RWRP.